Tropical pleasure smoothie with fresh tropical fruits . Summer has started with a bang, and yes it is getting very hot over here, as new house is on north of Houston we get more rain than rest of Houston. As a result my pomegranate plant which is new little kid in the block has leaves turning yellow and loosing it. When I checked in the internet found that it is because of lot of moisture as result stopped watering them, let me see whether they will survive or not. As my daughter’s pediatrician asked her to eat lot of veggies and fruits, she is eating fruits and veggies. I decided to make this delicious smoothie with her favorite fruits. 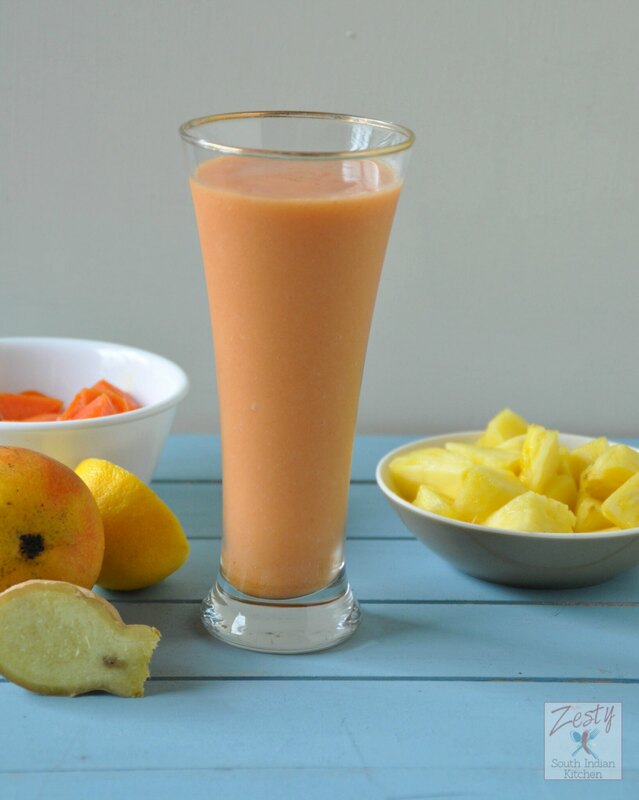 This tropical pleasure smoothie contains mango, pineapple, papaya, orange ginger and lemon. Beauty of this recipe is that it doesn’t have any added sugar and only the natural sugar from the fruits. I like to add ginger and lemon to my smoothie and juice, the kick which ginger gives is just awesome. I was planning to add some coconut water to the smoothie but I couldn’t find a nice coconut, sometimes it is too ripe so that you get taste of coconut oil in it. You need to get very tender ones. This smoothie is devoid of any my new found seeds, hemp seeds, flax seeds and Goji berries. It has just simple tropical pleasure. Make sure to grab ripe papaya which is more orange in color as it is sweeter, same with mango. 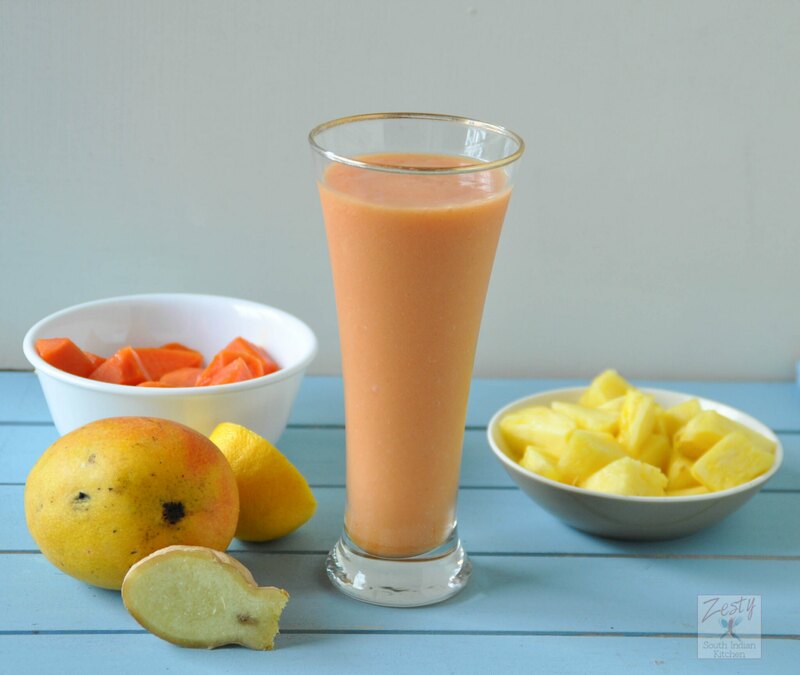 Trust me this smoothie is antioxidant rich (Pineapple, papaya), Vitamin C (lemon) rich and helps digestive health (ginger) and touch of cinnamon and lemon zest as flavoring without any extra sugar. I used unsweetened almond milk to make it creamier you can use your favorite milk. 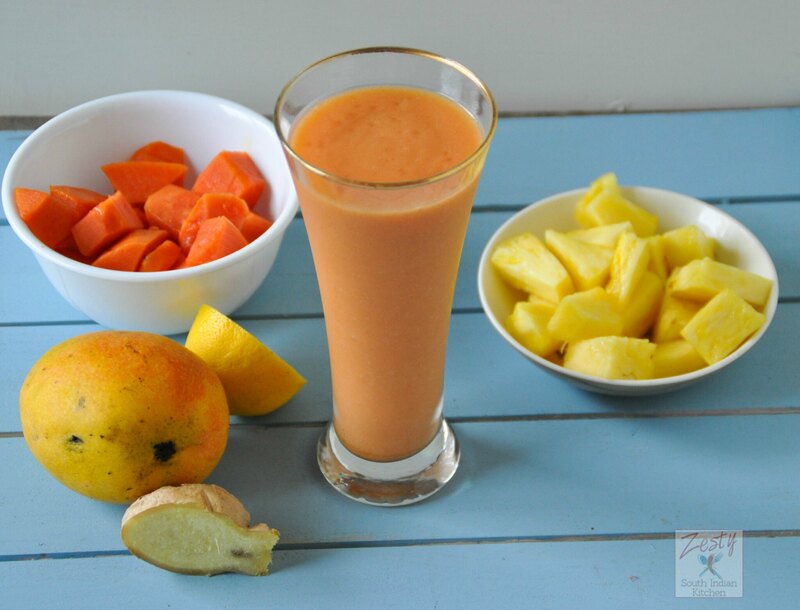 You don’t need to do a trip to tropics to enjoy this delicious smoothie. You can have it at the comfort of home. Then you can get full feel of the fruit. Here comes the delicious smoothie with favorite fruits. 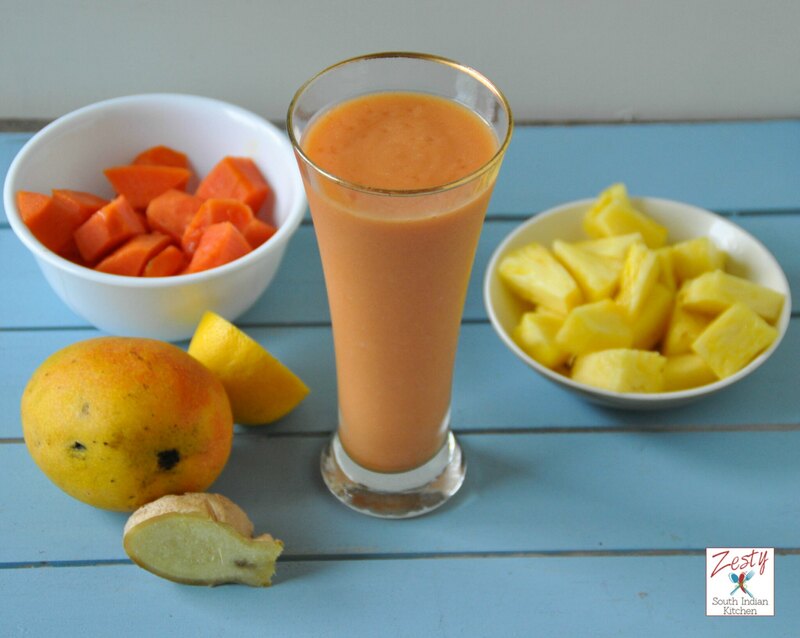 Delicious smoothie made with tropical fruits like, mango, papaya, pineapple with touch of cinnamon. In a blender process everything until you get a creamy consistency. Increase amount of ginger, cinnamon, lemon zest if you want. Enjoy immediately. Great recipe, Zesty. I can assure you that it’s getting pretty hot here in Prague as well 🙂 This looks like a good refreshment to have during those hot days. Preferably somewhere near water. Thanks Rafee, now updated the ingredients list thanks for letting me know. Swathi, this sounds like something I need to make for my husband. He is going to love this (and so am I)! Give it a try Jean it will be delicious. Welcome to Yum Goggle! We are following you on all social media and we hope you will follow us back. We will do our best to tag you each time we promote your posts! I see that you are a Texas Women Blogger! I am an Oklahoma Women Blogger and I just love Stephanie who started all those associations, don’t y ou? Kelli at YG! Yes Kelli, Stephanie is great, Thanks for liking my post. Sure I will be posting more on YUm Goggle.